Although it was only two weeks since our last game at Anfield, the gap of inactivity seemed a lot longer. Not to worry. As so many Chelsea friends remarked on Facebook, with the home game against West Bromwich Albion cheering us all up, “proper football is back.” I had been relishing Saturday 22 November for quite a while. Not only a Chelsea home league game in the afternoon, but there was a From The Jam gig to attend with some mates in my home town in the evening. Ah, the twin obsessions of football and music (in that order)…the passions which constantly bring enjoyment to millions of Englishmen (and women). I always used to say that if I met somebody new, either through work or mutual friends, and that person didn’t care for either football or music (in that order), then I knew we wouldn’t hit it off. I think that this still holds true. So, if, dear reader, you have stumbled across this website and your two passions are cricket and cars, or science fiction and soaps, or golf and gardening, it’s probably best that you scarper. And it is probably best that you check your search engines on your computer. The drive to London was uneventful, but it was just pleasurable to be heading to Stamford Bridge again. If the game at Anfield seemed like ages ago, then the QPR home match seemed ridiculously distant. The weather outside was grey and murky; it was, in fact, typical November weather. Before the game, there was a busy period of meeting up with friends in a couple of pubs. It was a pleasure to sort out a ticket for Ryan, a native of New Hampshire, who was visiting Stamford Bridge for the first time on this overcast November afternoon. It was also a pleasure to meet Kevin, an ex-pat now residing in Connecticut, who was back at HQ for the first time for a few years. It seems that every year – every match maybe – my Chelsea family grows and grows. In both pubs, the air was warm and muggy. Outside, too, it was surprisingly mild. The onset of winter was holding off for at least one more day. There was the usual banter in the pub. Yep, proper football was back. Although my interest in international football continues to wane – thank heavens that the third of the international breaks are behind us now – it still throws up occasionally interesting or mildly entertaining stories. Around ten years ago, when I used to work for a different logistics company, I used to book consignments for my client for Spain and Portugal through our office which was based in Dover. The small team in Dover was managed by a chap called Allen Bula, a likeable and affable man, who also used to do some scouting for Dover Athletic. His team was Arsenal, so amid many phone calls from myself which used to involve booking full loads to Madrid, or smaller consignments to Barcelona, Cadiz, or Valencia, there would be the inevitable banter between the two of us. I met him on a couple of occasions. In around 2006, he left P&O Ferrymasters to work for a logistics company in Slovakia called Steeltrans. Allen still stayed in touch and there was the occasional email, but we only used his new company a few times. After a while, I heard that his company were sponsoring the MFK Kosice club, one of the provincial teams in Slovakia. We then heard that Allen was working for Kosice as their football and academy manager. I was suitably impressed. A few years ago, lo and behold, we heard that Allen had landed the job of Gibraltar team manager. Allen was originally from that rocky outcrop at the base of Spain, and we guessed that he had “gone home” to answer the call. Imagine my joy when we heard that Gibraltar had been given full UEFA status and that Allen was now a fully-fledged international football manager. It’s quite a story. Of course, I have been watching Gibraltar’s progress on the international stage over the past two years with growing fondness; some recent heavy defeats have been hard to take, but I’m almost tempted to travel up to Hampden Park to see how they fare against Scotland in the current Euro 2016 qualifying campaign. A recent 0-4 loss in Germany was a mighty improvement after two back to back 7-0 defeats against Poland and Eire. While at MFK Kosice, Allen Bula uncovered the talents of none other than Nemanja Matic. So, Allen has gone from freight forwarder to international football manager. He was even featured in a documentary about Gibraltar on Channel Five during the week. There’s hope for me yet. I fancy applying for the Swedish women’s beach volleyball coach. Watch this space. On the walk to Stamford Bridge, I spotted a facsimile of a World War One recruitment poster which was displayed in the middle of the Fulham Road. The club historian Rick Glanvill was stood close by. What a lovely touch; it was a fine tribute to those young men who gave their all during that most calamitous of conflicts. 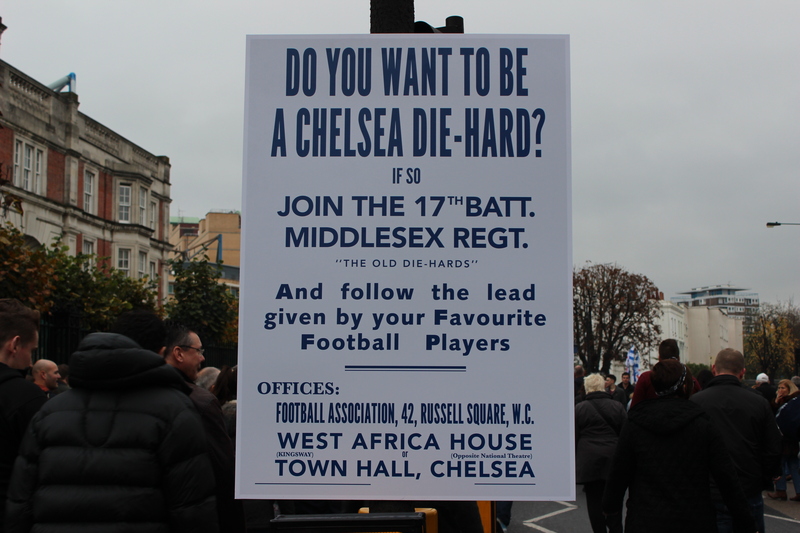 DO YOU WANT TO BE A CHELSEA DIE-HARD? IF SO JOIN THE 17TH. BATT. MIDDLESEX RGT. And follow the lead given by your Favourite Football Players. I noted several Chelsea supporters, scarves on – they looked like tourists – heading away from Stamford Bridge, scowling. I presumed that their search for tickets had not been successful. I made it inside the stadium with just a couple of minutes to spare; phew. I looked around and – yes – the ground was packed to the rafters. Although attendances are often given as sell-outs these days, the more attentive fan can soon spot the odd empty seat here and there. On this occasion, with no home game for three weeks, Stamford Bridge was bursting. It is no wonder that those fans outside were looking miserable. Again it was a very settled Chelsea team. The regulars were there. From Thibaut Courtois in goal through the spine to Diego Costa at the front, there was stability. It was a reassuring line-up. Not much had been said about the game thus far. There was the memory of the lucky 2-2 draw last season when…come on, let’s admit it…we were gifted a penalty after a “foul” on Ramires, but my view was that a win was vital, if not 100% expected. Chelsea began well and John Terry forced a fine save from Ben Foster in the Albion goal after just four minutes. After eleven minutes, a cross from Oscar was played in to the penalty area. From my position, watching in the MHU, it seemed that not only me but the entire West Brom defence presumed that Diego Costa had strayed offside. In one movement, the striker chested the ball down and volleyed home. Offside, right? I hardly moved, let alone celebrated. But there was no flag and no whistle. Goal. We were 1-0 up and I had hardly celebrated. Weird times. Chelsea then peppered Foster’s goal, with Costa coming close on two further occasions, the second of which went agonisingly close. On nineteen minutes, a short corner was played in by Fabregas to Hazard, unmarked, and the Belgian maestro settled and shot low. It was as easy and as simple a goal as I have seen all season. On this occasion the Albion defence were again sleeping. This was very promising. In an undoubted reaction to Jose Mourinho’s comments after the QPR game, the home crowd were in excellent form during this period of the first-half. It was lovely to hear. I joined in with gusto. In my mind, every fan should leave a game with a sore-throat. There was a dirty sky above, but a great atmosphere inside Stamford Bridge. The positivism sweeping the stands increased further when Claudio Yacob – who? – was sent off for a horrible lunge on Diego Costa. The crowd roared. Some of the football that Chelsea played in that sumptuous first forty-five minutes was just wonderful. The range of passing, the movement of the players, the fluidity, the style…it really was mouth-watering. Was it the best of the season thus far? Yes. In the middle were the two ever-presents; the intelligent brain and skilful passing of Cesc Fabregas and the tireless running and blocking of Alan Bula’s boy Nemaja Matic. A couple of Foster saves towards the end of the first-half denied us further. With the score 2-0 in our favour at the break, and with the visitors down to ten men, there was a high degree of expectation for a sack full of goals in the second period. Sadly, the second-half rarely reached the heights of the first period. Nemanja Matic was especially profligate, but our long-range shooting was very poor. Foster continued to make some great saves and blocks, but the West Brom players – neatly stationed in two deep banks of four, with the much heralded Berahino a lone striker, hardly involved – maintained a great shape throughout the second-half. I guess it was all a little anti-climactic really. And I hated myself for thinking it. Yes, Chelsea are playing some lovely stuff at the moment and – yes – we are everyone’s championship tip, but I’d hate to think that I was taking any of this for granted. I was just glad that Ryan and Kevin, the visitors from afar, got to enjoy that blistering first-half display, plus the two goals, down at their Shed End. It was a stupendous evening. From The Jam, including original Jam member Bruce Foxton on bass, were in great form, playing the Setting Sons album in its entirety before treating us to all of The Jam’s greatest hits. The beers flowed and the laughter rung out. I always smile when I go to watch my local team, Frome Town, and the teams come on to the pitch to the sound of The Jam’s “Town Called Malice.” That song, plus all the others, made us sing and made us dance. It was one of Frome’s greatest nights. That’s Entertainment. Dedicated to the memory of John Neal, the manager of Chelsea during my favourite ever season of 1983-1984. Rest In Peace. This entry was posted in Season 2014-2015 and tagged 2014-2015, Atmosphere, Gibraltar, International Football, Music, Nemanja Matic by Chris Axon. Bookmark the permalink.